The Boudior is coming along nicely. There are some differences of opinion as to what is right/wrong/asthetic and not achieveable with my meager skills, but nonetheless we are getting there. I felt I should put this picture here coz I think I didnt do too bad. Morts boudoir is coming along apace. All the insulation is in place and the battening out is complete. The walls were delivered this morning. One was returned damaged. It may have been OK it could probably have been trimmed in the waste, but that is not the point! The first wall went up this morning. Her ladyship thinks it looks fab. Pictures can be found on the Dr Bones Blog. People are complaining that cyclists are racing down the hill beside the locks. This is since the towpath was upgraded to a cycle track by BW in conjunction with Sustrans. People are being knocked down by the cyclists and often they don't stop. The latest victim was a 79 year old lady dog walker. The rider didn't stop! Well that's them sorted file that under 'bunch of bloody cowards'. You know if you open a path at the top of a hill that runs for about a mile it will attract a bunch of prats on wheels. What didn't BW understand about that? They have put up 'SLOW DOWN' signs on the hill which have been ignored, Oh really! The have threatened 'stronger measures', but BW are keeping that to themselves for the time being. Maybe they are going to install a Garrotte halfway down the hill. That would take them by surprise! The answer is very simple a number of cycle gates spaced at a distance that hardly makes it worth while getting back on their bike. I don't suppose anyone has any idea where one could lay ones hands on some redundant bollards they might do the trick. Work on the Good Ship Bones (GSB) continues apace. The entire bedroom, except the bathroom bulkhead has been Vactaned (rust treated). This done it was necessary to paint over the whole shebang. Using up old pots of paint the room in now mostly blood red. This is a mixture of Crown gel paint, Hammerite, and rather than open a whole new tin of something else red, some ahalf empty International Mid Blue to finish. The floor is ordered and will arrive tomorrow. I can't get it in the boat until I have cut it. With my luck it will be pouring down with rain. Happy Days! Yesterday our tame engineer built and welded in the brackets which will allow the bed to pivot upwards. Very smart job. Pictures will be available later. Yesterday we took the good ship Bones up the canal to near the maintence point. A simple task that has her ladyship on the tiller in reverse and me at the front with a shaft. Before we had gone very far a hire boat came alongside overtaking us. The lady leaned across and said, "I read in a boook recently the the best way to go in reverse was to open the throttle to max and then you will be able to steer". The bloody cheek of the woman. Says I, "so I can forget our 5 years experience then?" "Oh sorry, I didn't realise" says she. Didn't realise! If she had read further she would have read the bit about not overtaking a reversing boat and the bit that says who the F*** are you! It later transpired that she is a teacher and finds it very hard not to be in teach mode. I could show her how it is done with a shove in the water. That will learn her. The trouble with reading it in a book is a book doesn't give you hands on experience. I have seen fleet owners reverse in a straight line at top speed but they have been doing it thirty years, and anyway what's the hurry? I am sure somewhere in the past Tom Crossley told me "Don't do forums". Now I see that NBW is to have its own. Originally only specially invited members, the great and the good of boating. were allowed to participate. Now I read "Forum has gone through its technical trial, it will be open to the public tomorrow—Friday." (that's my bold). NBW says "This is by no means in opposition to any established forum, but one that will be better regulated and will allow readers to comment on narrowboatworld's content and have contact with its contributors." (that's my bold). The most popular Canal Forum at this time is owned by a policeman (who is very mindful of the impact his forum could have on his career) and has some very diligent moderators. Better 'regulation' means if the mods don't like what you say it comes off. We already have contact worthiness contributors and can comment on NBW content so what are they offering us? Further NBW says "But please be aware that though controversy will of course be allowed, controversy will of course be allowed (I said that bit twice because they did) as it is in narrow boatworld itself, personal attacks, bad language and copyright material will not. There will not however be pages of unenforceable rules and regulations, in fact except for the three above there are no rules whatsoever". (that's my bold again). BS I say, time will tell. I wonder how long it will be before the Continuous Cruising thread is blocked. I have had an ADSENSE banner on the blog for just over a year. This has earned me the princely sum of £21, thank you. Yesterday I took the banner off and the blog template went to scrap. I will get it back again but it will take time, meanwhile all the links, if you cant see them, are at the bottom of the page. Word to the wise dont fiddle with the blog before doing a backup. DOH! This was a comment from Area D in the last post. I felt it needed a airing on its own. There are no wheel clamps in France. This is because when they were introduced the French public put super glue in the locks. Within two weeks they were withdrawn. Single-use wheel clamps simply are not economic. The French public acted together and stopped the scourge. We allowed it to go on and so we still live with them. Whatever you think of the French they do tend to stand up to bureaucratic claptrap more than we do. A 76 year old grandfather was issued a £60 littering fine after his cigarette, which he had only just lit, was knocked out of his hand. The over zealous warden called him away from where his cigarette had landed so he was distracted from picking it up, he had only just lit the cigarette so it wasn't a case of just leaving it. He wrote to the council and asked for them to investigate. They said, "Pay up or the fine will be increased to £80". Maybe if he had punched the warden in the nose he would have just got a caution from the police and not a £60 fine. Abingdon Council operate in a similar way in their car parks, as do most councils, if you over stay the fine is £80 but the noticeboard says 'if you are a good little citizen and pay within ten days' the fine is reduced to £50. This of course is an attempt to make you think you can save thirty quid and pay up without argument. The wrongness, if there is such a word, of this is that it is a faulty edict. The fine is £50 if you do not pay up with in ten days it is increased to £80. It's a bit like saying if the dentist smiles it wont hurt. The Abingdon system relies on the fact that people people don't want to over pay for their parking and by the same token cant always guarantee when their business will be concluded. Pay and display car parks are a con often robbing the public by not giving change and not allowing people to pass on tickets by insisting you type in your car number before you can get a ticket. There you could pay for 4 hours finish in two and the council wont give you a refund but overstay 5 minutes and WHAM! Pay up sucker! This is not really about paying for what you get it's about controlling people and making a shed load of money. Who owns the car parks? We do. So why are the councils fining us for parking in our own car park? The answer is a simple one. WE LET THEM DO IT! Is this how fascism starts? Have you ever wondered where all those school bullies went to? I think they become councillors and MPs. Last year I didnt have a mooring. I travelled up and down the South Oxford to a greater or lesser degree. This year I have two moorings and I am having trouble getting rid of one. Please don't tell me there is a shortage. Last Thursday I drove to Lower Heyford where I met up with Graham (nb ALNWICK) and cruised down to Thrupp arriving at dusk. A really nice day. Added to this Bones cooked dinner for G&J and us. Halfie (nb SHADOW)came to visit Friday we had lunch at the Boat Inn with him and dinner at the pub later with the Alnwicks. This was also her ladyships birthday which started with opening of the prezzies ceremony. 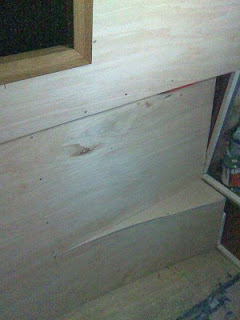 Bones (nb BONES) had her new side hatch installed on Saturday and of course there was the banter in the evening. Probably the best one yet! Sunday at 9 we were awoken by Alnwick to accompany them on the journey back, we were also joined by Simon (nb TORTOISE). What a good day out despite the cold and the rain. Bones and Jane and Simon left us at Heyford and Graham and I continued on. The girls had gone off car swapping and, arriving back at Aynho, walked sown to Somerton Lock to meet us. We managed to make it to Aynho. Jane cooked us dinner before we settled down to watch some very informative vids about trains. GC fell off the book case and tried to look nonchalant with that 'I was trying to do that' look. Graham took us both home about 10ish.